​Ana Maria MICU implies that things constantly change shape and migrate from one reality to another. In respect to image formation, she observes that nothing can be more real than the image that one’s holds in his mind, as a model, or as a deciphering code. An image’s home is within another image, in an ever-expanding scenographic contextualization. Speaking About the Unknown is a residency project by MICU and is exhibited as a temporary installation of 3 images, made especially for the gallery space. 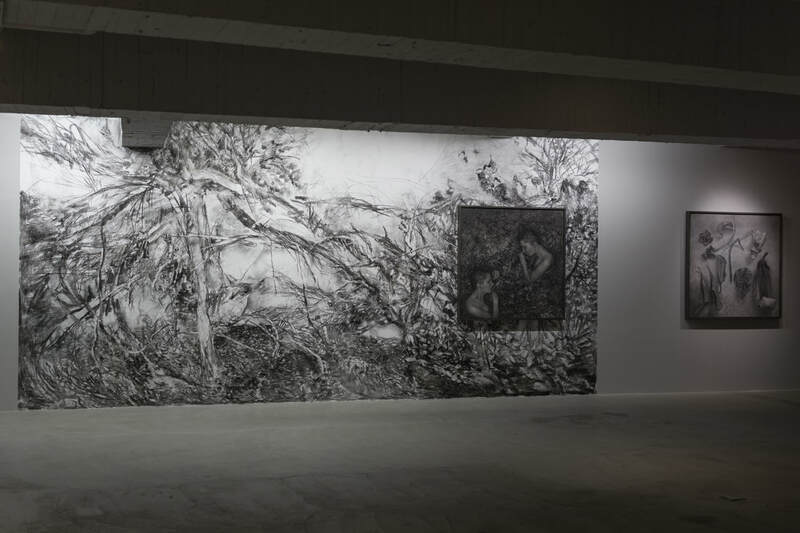 A large scale wall drawing is the background supporting a framed drawing on paper, while another such work is placed nearby, directly on the naked surface of the gallery wall. Realistic representation based on photographs is combined with a freehand drawn and perceptual-based type of image. 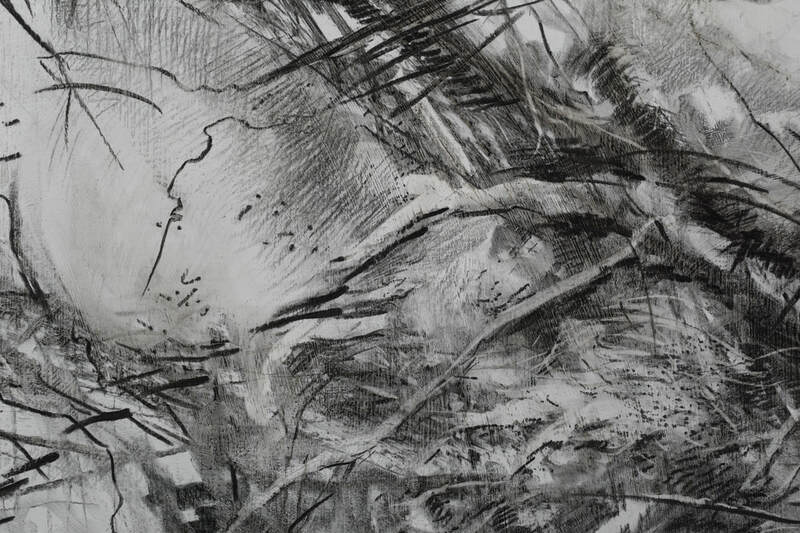 Taking further conventions from the tradition of figurative painting as aerial perspective and the common sense notion that everything that is real receives light and drops a shadow, the artist developed an imaginary scene, with a gradual accumulation of charcoal interventions, over a limited time period of two days. 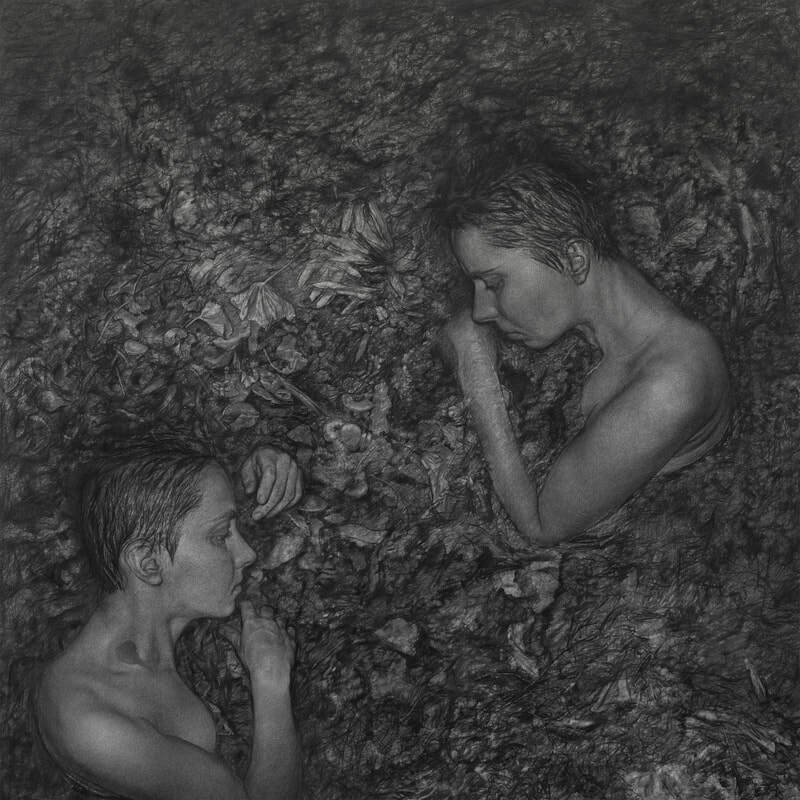 With an allegoric double self-portrait suggesting human body decomposition displayed adjacently to a botanical illustration of plants unknown to her, she starts a conversation base on the topics of fading, disappearing, change and renewal, while the viewer is invited to exercise an act of identification and to develop a personal narrative, by experiencing the impact of the enveloping large scale image. 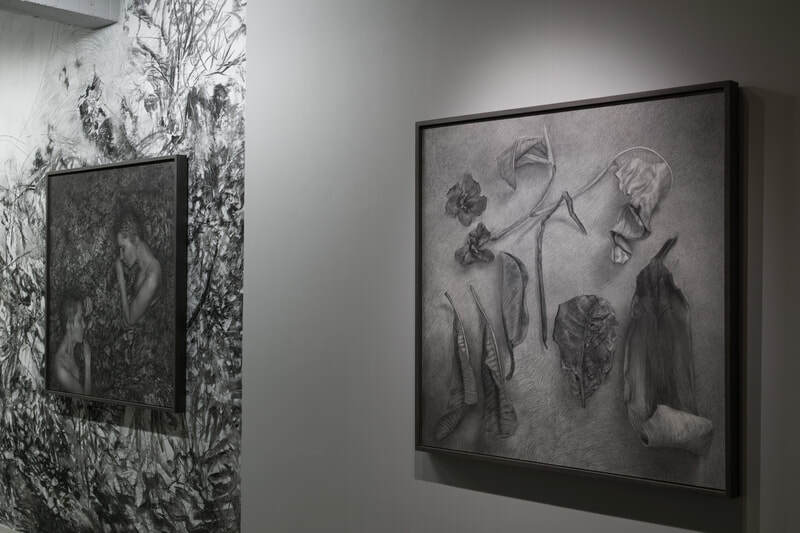 The show consists of paintings, drawings, and a looped animation: a cross-medium tactic that makes an abstraction out of visual reference material gathered from the artist's home and studio over recent years. The aspect that interests her the most is a fascination with the fact that she is able to force coherence out of a broken narrative, apparently on a criterion of which she is not fully aware. The paintings are interior scenes and self-portraits, a frozen succession of fleeting biographical moments, highlighting the recording property inherent in everyday objects. They impartially reflect our choices, maybe much better than our memory does. 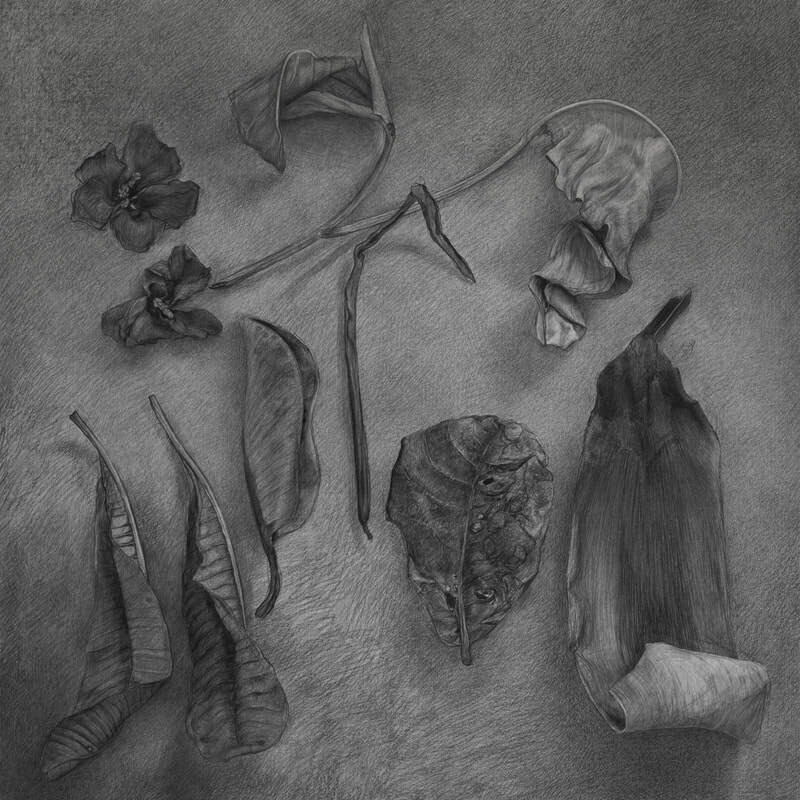 Marks of the passage of time, the endearing idealism of obsolete design, things that were left behind, abandoned or broken, are the details that the artist notices, allowing herself to be changed by her observations as she paints. The drawings and the animation are tied together in an experimental technical relation. Being based on video footage and not photographs, when viewed continuously, the drawings render a type of movement visible between them. The animation is not created with the traditional technique but is largely based on photographs of working stages of the drawings, thus being more about the process that was followed, as about depicting an action. The subject matter is the artist, captured while painting, turning her head as she looks back and forth between the photograph she uses as a reference and the work itself. Going through several imaginary characters until completion, by building on certain mistakes that are temporarily favored and individualized, this body of work concludes with the finding of an image that could be declared a satisfactory likeness and a proportional representation. A personal interpretation assigned to creativity is reduced to the simplest act of a lingering and consecutive gaze, and events that follow this action in a natural manner. 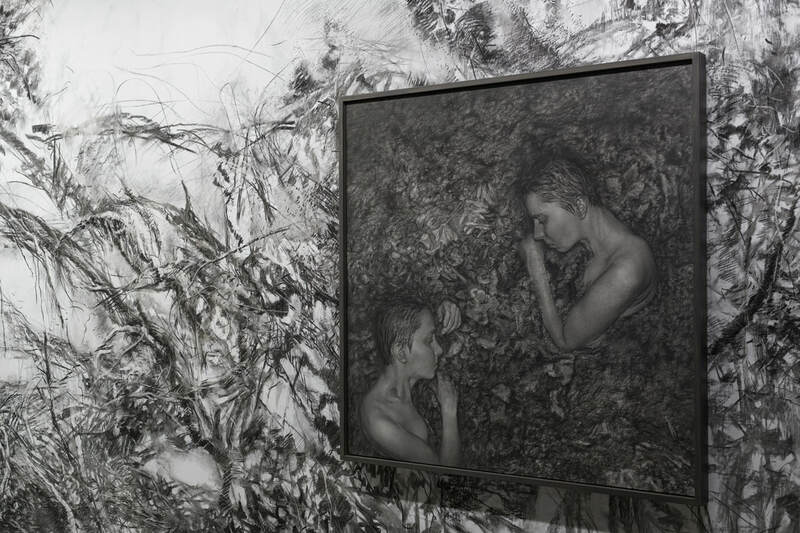 By restricting her examination area to the first circle, closest to her being, the artist tries to mimic a regression to a primitive state in which one’s world is no larger than the interest to meet basic needs. Based on an intuitive supposition, the need for artistic freedom and manifestation is included within this narrow list. No matter who you are, if stranded long enough on a deserted island, you will end up writing a book. In addition to being a cry for help, a message in a bottle is just that: the book’s first draft.